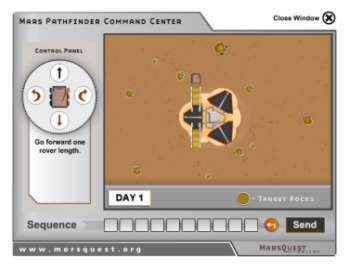 Try your hand at driving rovers the way NASA does. You can only send one command sequence a day, so you’ll have to plan carefully. And yes, it is possible get to every target with one day to spare. About 80kb: opens in new window. One command sequence per day: The Deep Space Network that is used to communicate with all spacecraft is very busy. NASA scientists only had one window per day to talk to Sojourner. Command sequences, not steering: Because radio signals take at least 20 minutes to reach Mars, you could never steer the rover in real time. Rover scientists and engineers spend each day studying photos from the previous days to plan the days operations, then upload a sequence of commands. Only a week to drive: the Sojourner rover’s nominal planned mission lifetime was about a week. It actually continued to operate for 12 weeks. Newer rovers are planned to operate for longer times. You can learn more about rovers in our Rovers Tour. Or you can go to the Mars Tour Home and explore even more... Volcanoes, Canyons, Floodplains. Finally, if you want to do something a little deeper, try our Mars Investigations.